The AAP “discourages media use by children younger than 2 years.” They recognize that babies and toddlers will be exposed to some TV in today’s world, but they recommend that families try to limit TV time as much as possible – including both TV designed for kids and “background TV.” The policy statement describes the research behind this recommendation and gives some alternatives to TV time. The answer: NO. Research has not found any benefits to television watching in children under 2. In one study, a Teletubbies program was played both forward and backward to babies, and it was not until they were at least 18 months that they could differentiate the two versions (Pempek et al. 2007). Though this program is billed as being educational and specifically designed for kids ages 1 to 3, it is probably no more than flashing lights and jumbled language to most kids under 2. This might entertain your baby, but it does not educate him. 2. Is there any harm in my infant or toddler watching TV? Maybe. Several studies have found that babies who spend a lot of time in front of the TV have short-term language delays. We don’t know for sure that TV-watching caused those delays, but the association is there. Long-term effects haven’t yet been studied. 3. What if I want to watch my own shows while my baby is playing in the same room? He doesn’t seem to really watch them, so I don’t think they bother him. If the adults in the room are watching TV, then they probably aren’t interacting with their children as much. Infant vocabulary development is directly related to the amount of time parents spend talking with their babies, so when parents are watching TV, baby is missing out on learning new words. Even if baby doesn’t appear to be watching an adult TV show, it is still distracting to him. In one study, 12, 24, and 36-month old children were observed playing while an adult television show played in the background. The children glanced up at the TV about once per minute, and only for a few seconds at a time. However, just this brief interruption in their play significantly reduced the total time they spent playing as well as their focused attention during play (Schmidt et al. 2008). For a baby, interrupting their play is interrupting their learning. I suspect that cutting out this “background noise” TV-time will be the hardest sell in many families who are simply used to having the TV on all the time. I know we’ll still be watching football on Sundays in our house. Still, knowing that the TV could be getting in the way of a baby’s learning might at least help families remember to turn off the TV when nobody is watching and to try to watch adult shows while the baby is sleeping. The bottom line is that TV isn’t good for babies, whether they are watching a children’s show or there is an adult show playing in the background. Playing games with other children or an adult. The more time a child spends in front of the TV, the less time he has for these healthy activities. Many parents use TV to occupy their babies or toddlers so that they can get something done – take a shower or cook a meal, for example. Parents simply don’t have the time to sit on the floor playing with their babies all day – they have too many other responsibilities. The answer: Let your child play independently. Certainly make time for playing and reading together, but it is also good for babies to have time for free play everyday. The AAP endorses it! If they have a safe environment and a few simple toys, babies are remarkably good at entertaining themselves. Play is how children learn. They test hypotheses, solve problems, and practice creativity. Allowing your baby time to play independently isn’t lazy – it is actually good for the baby and definitely better than watching TV. 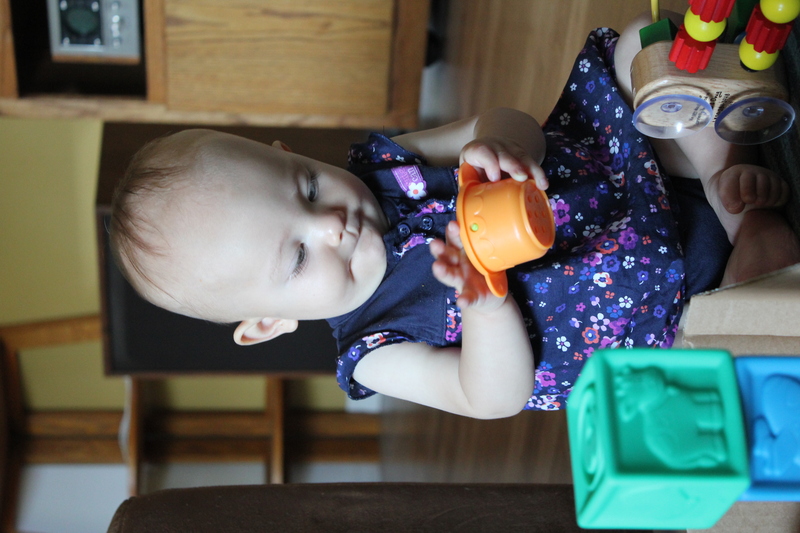 Free play is valuable to a baby’s development, plus it is a good skill at any age to be able to occupy yourself without having constant input. Meanwhile, you can work on getting dinner on the table! Psychologist Alison Gopnik’s TED talk on how babies learn. In under 20 minutes, Gopnik gives an entertaining, easy-to-understand window into how babies think and learn like scientists, through their play. She says that because everything is new in a baby’s world, babies are constantly taking in tons of new, vivid information. Gopnik says: “So, what’s it like to be a baby? It’s like being in love, in Paris, for the first time, after you’ve had 3 double espressos…” Now, imagine having Teletubbies turned on high volume in the Parisian cafe. It ruins it, doesn’t it? For more on cultivating free play with your baby and other alternatives to TV time, check out Janet Lansbury’s post, A Creative Alternative to Baby TV Time. She provides some helpful tips, and the video she included is super cute, too. How much TV does your baby watch? Do you think the AAP recommendation is practical for your family? Has your pediatrician ever asked you about TV use in your house? *For this policy statement, the AAP focused only on “static” video programming – such as that on TV or a video. An increasing number of infants and toddlers have additional screen time with iPads, smartphones, and computers. Time spent playing interactive games on these devices probably affects kids differently than TV, but no studies have been published investigating this latest trend in baby entertainment. Council on Communications and Media. The American Academy of Pediatrics Policy Statement: Media Use by Children Younger Than 2 Years. Pediatrics; published online October 17, 2011. Pempek TA, Kirkorian HL, Lund AF, Stevens M, Richards JE, Anderson DR. Infant responses to sequential and linguistic distortions of Teletubbies. Poster presented at: Biennial Meeting of the Society for Research in Child Development; March 27-April 1, 2007; Boston, MA. Schmidt ME, Pempek TA, Kirkorian HL, Lund AF, Anderson DR. The effects of background television on the toy play behavior of very young children. Child Dev. 2008;79(4):1137–1151. I do believe this to be true. As a Speech Pathologist I often recommend less TV time. Parents will defend the TV to the end sadly. I remember making a home visit to a family with other therapists and they asked my opinion as to why this particular child was so delayed . I remarked that he probably was propped in front of the TV most of the time. When we got there the baby brother was propped in front of the big screen TV.All the people with me looked at that and nodded. If you recall I had no TV when my children were growing up. I believe it is something that parents MUST think through carefully. Ms. Eyeball:) – I think you’re probably right about the connection between TV time and speech development. The AAP is careful to not say that there is a direct cause and effect relationship between more TV and speech delays, because this is hard to prove through a scientific study. We can’t tell families to randomly put their kids in front of the TV all day and see what happens to them – that would be unethical! So the studies that we have show that kids with speech delays did watch more TV as babies and toddlers, but we don’t know if those kids would have the same delays if the TV was off. We don’t know if these same parents would necessarily talk or read to their kids more if there was no TV. Regardless, even without a lot of language exposure, those babies would probably learn more by playing independently than watching TV. The best way to study this question would be to enroll families in a study at birth and randomly, in half of the families, provide them with a great educational program about why they should limit TV exposure in their kids. If that program works and the families with the program use less TV, then you can compare language development outcomes in the children to see whether TV exposure had an effect. Thanks for your insight, Zandra. It sounds like the families that most need this advice are the ones that actually have bigger problems to contend with. You also point out that we don’t have really good data on whether or not TV hurts kids, just associations, as I described in my comment above. That was the take by another blogger that I follow – Polly Palumbo – http://mommadata.blogspot.com/2011/10/do-we-know-anything-about-kids-and-tv.html. Reading her piece made me wonder if I was too soft on the AAP, since they don’t actually have a ton of data to support their recommendation. But, in their defense, they do just say that they “discourage” TV, not ban it. I think it is helpful for parents to know that their baby or toddler isn’t going to learn anything (useful) from TV, so they should think of it as an “empty calorie” type of activity. And we do have good data on the real benefits of reading to babies, talking to babies, and play time (independent and interactive), so I think you’re right that the focus should be on encouraging those activities and discussing how valuable they are to babies. Ultimately though, it doesn’t matter what the AAP says in their policy statements – it matters more how this information is presented to parents, and you have the tough job of figuring out the best strategy for each patient:) Thanks again for reading, and I love your comments! We don’t have a TV in the house, which definitely limits W’s screen time. I hate the way she fixates on it like a moth to a flame when we’re at her grandparents’ house, though! I do have to shamefully admit that once or twice, when we were stuck in the car on a long drive and she was screaming like a banshee, crying big tears, and holding her breath in her car seat, I did turn on an episode of Grey’s Anatomy for her on my iPad. I actually did the risk-to-benefit on it, and decided the screen time was the lesser of the evils, as compared to a) the cortisol she was generating, and b) the distraction to my husband as he tried to negotiate traffic! Oh well. Kirstin, I definitely think that a little TV now and then is not a big deal. We have a special policy in our family for travel: do whatever it takes to make the trip pleasant – for the sake of the kid, her parents, and everyone else within earshot! No shame in that, I think. But its awesome that you don’t have a TV in the house – better for everyone, I think! The young brain is developing according the experiences the baby has. Passive visual images result in a different connectedness in the brain – different from movement, exploration and interaction with other people. Totally different. Barbara, I completely agree! Thanks so much for reading and for your comment. I grew up in a farm village where we were sent outside to play all the time. We had a TV, but we only got 4 channels and only one of those was in a language we could understand, so programming varied greatly between geared towards kids and not. We little ones pretty much only got Wednesday afternoons, and even then is was usually just a rotation of the same handful of movies. But when I moved to the UK and being outside meant being harassed for “loitering” and the assumption that 11-15 year olds have no reason to be outdoors unless they are doing something illegal, I developed the habit of sitting in front of the TV all the time. Even if I wasn’t actively watching, it was always on in the background. So when I moved out on my own and went to university, one of the first things I did was sign up for cable. After about two years, I realized that having cable is actually really expensive when you’re on a student’s budget. Besides which, I wasn’t able to fully concentrate with it on in the background and it was affecting my school work. So after nearly a decade of round-the-clock TV, we disconnected the cable and kept the TV itself just for watching movies. A few years later and we got rid of that too. I definitely buy the AAP recommendations. Certainly, from my own experiences and from babysitting kids, I’ve seen how much TV interferes with other kinds of play. I remember my disappointment when I babysat for the first time. I came with bags of activities (origami books, games, books…) and ready to have fun, but all the kids wanted to do was sit and watch TV. They sat there like little zombies for hours until I had to pry them away for bed. I thought back on my own childhood at their age and how many memories I have of playing and running around and exploring, while these kids just lost an entire evening. So for my own son, we’re taking the AAP recommendations seriously. I do watch movies (with earphones on) while he nurses/naps just because I’d go nuts without something to do and I haven’t worked out how to hold a book while nursing, but he faces away and he can’t hear it. We do have friends who keep the TV on all the time, so I usually take my son into another room if appropriate, or just make sure that he’s faced away from the TV most of the time. Although, honestly, a couple hours every month or so probably won’t break him, so I don’t sweat it too much. I do think it’s a shame, though, because they have a son pretty much exactly my son’s age and they’re just getting to the point where they have an interest in interacting with each other, but neither of them can concentrate with the TV on. Thanks for sharing your story. I rarely hear of people who got rid of their TV/cable and regretted it. There are so many other ways to fill your time, and your son won’t miss it, at least for now. I grew up without a TV in my home, and I will admit that when I hit middle school and realized how weird that was, I would have loved to have a TV. In hindsight, I’m glad my parents kept our house TV-free, because I know it meant that I read more and had more imaginary play. Kudos to you for finding other ways to engage your son! I think that’s a really good point. I’ve never met someone who said that they were satisfied with how much time there is in a day, and yet we dump hours every night into staring at a screen. Well. I am guilty. I don’t think I want to try to defend myself here, but here is how tv works in our home: my daughter is 18 months old. She was not exposed to any tv (don’t own a tv, but a computer) until recently. She is allowed to watch 1 or 2 (!) episodes of sesame street a few times a week. I use that time to vegetate myself. I am a full time sahm and read at least 10 books a day to her, paint or draw, do puzzles, play outside… We have play group available twice a week and baby/mommy yoga once a week. We cook together, sing together, cuddle, cosleep, breastfeed, giggle and play…. And there are also times where she plays independently, though it seems this is the biggest challenge at times. We don’t use electronic toys, eat an all organic sugar free diet…. And then there is sesame street. She loves Elmo. She also walks away from her occasional tv time to do something more interactive and entertaining. She is not exposed to second hand tv because I don’t watch any tv or movies ever. Her language skills? She is speaking in 2-6 word sentences. Soooo, I will say this: I think she’s doing fine. I think she is growing and learning exceptionally and I do everything I can to nurture her. Does this article make me question? Definitely. So in the meantime I will probably cut down the sesame street to once or twice a week. But I think that the more important aspect that this article states but should go into more is how available you are overall. There is a big picture in being a parent and if you are doing all the best things for your child and they watch a few hours of videos a week…. I think they will turn out fine, and, as in our case, continue to excel. Where are the twin studies on this subject? I have looked and I can’t find anything. I have a feeling, like just about everything else, that there are no long term affects from tv viewing.